The best thing about having the LBM sandbox is that I get to invite people over to play. One of the most vibrant artists I know is the 30-year-old Dutch bookmaker/installation artist Anouk Kruithof. Anouk’s work is dizzy and alive; she makes me want to go out into the world and play. So last August I invited Anouk to make a book with Little Brown Mushroom. The result, A head with wings, is a dream-like sandcastle of a book (with sponge walls and secret tunnels). Anouk and I recently chatted about how the book came about. ALEC SOTH – So I think we should start by giving a little history. You and I met in 2009 at Fotomuseum Winterthur. At that point you had already published a couple of books. Since then you’ve been cranking stuff out like crazy. I mean really, really productive. ANOUK KRUITHOF – Eight years it’s been since I’ve graduated. Six published books, mostly artist books. I like the form of the book a lot. My mind is always thinking in books. SOTH – There’s no formula for a great book. You can work on it for ten years and really craft it, or it can be something that’s done in a week. And there can be a real energy from that thing that’s done quickly. It’s like music, you know, people can spend forever in a studio or it can be a live album done in one night. And the live album can be just as good or better, because it has that energy. SOTH – Your book Playing Borders had that kind of frenetic energy. It was so chaotic and kind of falling apart in a wonderful way. I thought it was great. After seeing that I wanted to work with you. I also thought it would be kind of a challenge for you to make a book with us because of the way our Little Brown Mushroom books incorporate storytelling. I don’t think of your work as particularly narrative—it’s very fragmentary. So I thought it would be interesting to see what you could do with narrative, and then also to work with these crazy pressures of the limited size and incredibly limited timeline. I asked you in August, I think, and we had the book out by the end of September, which is pretty amazing. KRUITHOF – Was it really August already? SOTH – I looked it up; it was August 7th that I asked you. Incredible! KRUITHOF – And when was the book done? SOTH – September 29th. So that’s less than two months from my asking! All of the other books we’ve done have come from existing material, but in this case it wasn’t. I mean, you used existing photographs, in a sense, but the structure and collages had to be recreated. You had a big assignment! KRUITHOF – Yeah, of course, I was a bit surprised. Like, oh no, the pressure of the deadline. You said “well, just lock yourself up for two weeks in the basement and you can do it!” I just said, okay, maybe it’s possible. Then I got this email “Ten weeks until the New York Art Book fair!” And I was like, what did I get myself into? But it was actually quite good because I’d already started to work on a very extensive new book out of snapshot photographs, like my diary photographs, that I’ve made over the last twelve years. So I had already made a selection hanging in my studio when you ringed me. I once made this series of portraits of this typical man. I had 18 photos of him in my archive from which I always was very sure that I wanted to do something. So I made the decision to use him as the “main character” of my story. I photographed him in Berlin in 2008 in a park and I was really fascinated by his gestures and his expressions. The man was either tripping or having a psychosis, but you didn’t know what’s going on with him. He was just so far away from reality. He was just living his own life. SOTH – Were other people noticing him or was it just you? KRUITHOF – A lot of other people were noticing him because he was a little odd. He was kind of dancing and walking and looking at things that didn’t exist. The man became the only thing I could look at in that moment. I filmed him and made photos of him, but I never did anything with these pictures until now. SOTH – There is something about that guy, which, for me, somehow connects to the other work you’ve done. The man on the cover of Playing Borders has a similar gestural quality. It’s like a businessman who’s dancing, almost. Your portraits, if you want to call them that, are these people that are sort of wrapped up in their own worlds or performing without an audience. Is that a common theme? SOTH – So this gets into one of my primary interests: the limitations of photography. Photography deals with surfaces. So you make a picture of a person and all you really see is their clothing, their skin – you have no idea what’s going on in their minds. It’s all projection. That’s both the beauty of photography and also the frustration. Unlike a novelist, you can’t write down what’s going on in their mind. This series of books came out of that frustration and my jealousy of storytelling. That’s where it’s kind of interesting to see what you would do with the text part of it. How did you respond to using text? And how did you want to approach it? Because there’s a beauty to just seeing this guy and not knowing anything. KRUITHOF – Yeah, it’s true. First I had 80% of the final images finished. In the meantime, I was struggling with what to do with the text. I gathered many interviews with schizophrenic people. I’ve red about mental illness a lot. Found a lot of written experiences from people having trips. But I went through all the footage and figured out it wasn’t interesting enough to use. Nothing worked out. I also did not feel to make a compilation out of other peoples words. Some of my friends encouraged me for longer already to start writing as well. So I started to just write a fictional short story, which in a way, wasn’t related to the images in another way it is. I think how the end result is now: the images are not illustrations towards the text. SOTH – Yeah, the thing I’ve learned in doing these books, is that if you tie the text to the image too closely, it kills it. That’s what I like about children’s books; the ratio of text to image is right, and the writing is often very simple. You don’t have to sound like Proust or something. You can use this very simple non-descriptive language because the photographs are descriptive in and of themselves. But you go to strange places in the text. Where does the sponge in your story come from come from? KRUITHOF – Oh my god, my obsession for sponges! The sponge came from another work that I recently made. “Der Ausbruch einer flexiblen Wand (weich und hart)” is a diptych work existing out of 2 enormous b/w wallpaper prints with 2 images of exploding “spongewalls” in the darkness. I like the sponge in content, material and form. In high school we had the blackboards with all of the information of the lesson on it and at the end of the lesson everything had to be erased with a sponge and water. Basically you erase the past, draw a line for a new beginning. I see this “spongewall” as a metaphor for the wall people have around them, my fascination where we were talking about before. In my text, as well as in the images of ‘a head with wings’ and in the wallpaper diptych you’ll see this ‘breakthrough’. To me this is the point where things are getting mysteriously interesting. 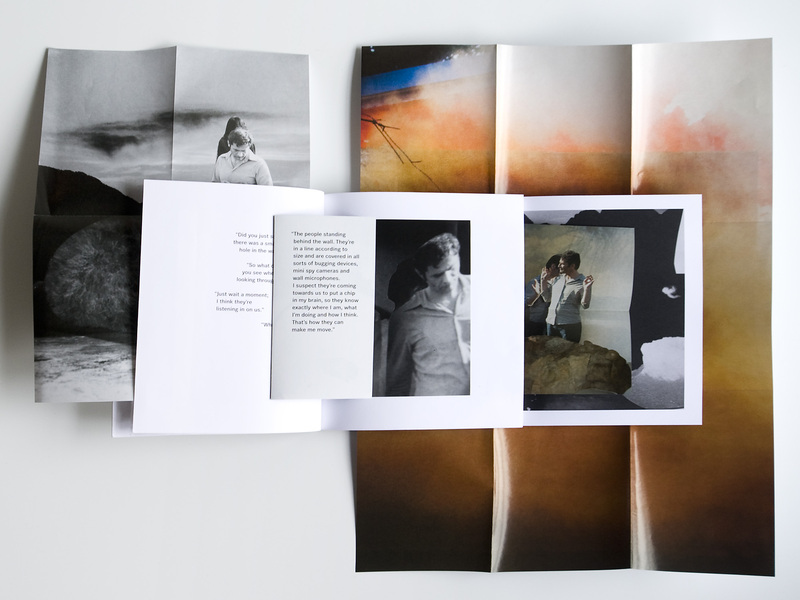 SOTH – There was such a speed to making this book. I think what must have been very difficult for you was the fact that you were traveling too, right? You were in France? KRUITHOF – The French Alps! I was in a village where there wasn’t even a bakery. It was good. I needed it the quietness for my concentration. There was too much going on around me in Berlin. SOTH – So you were there, but Hans Seeger, our LBM designer, was in Wisconsin. You know Hans and I live in nearby states, but we’re actually very far from each other. So we’re dealing with this very physical, tactile object, but the three of us are all over the world communicating about an imaginary object . I think this must have been very difficult for you because you’re so much a maker of physical things. SOTH – I think of you as having a real Dutch design sensibility. You might not think of it, but compared to other books from all over the world, I kind of know where they come from without knowing anything else. But in the case of this book, you’re working with these two American guys and I’m wondering if you feel that in the end result, if it changed the book, or not? KRUITHOF – Not in the end, but in the beginning for sure. Of course when I saw the other books, I also looked into Hans and I thought, whoa, that’s like a different planet. The books I see in the Netherlands or in Berlin and how the photography books are made in America, it’s hard to talk about, but there was a big difference in approach. So I was a bit worried in the beginning, but I’m really happy with the result now. The fixed elements for making this book like the format, the sticker, the cardboard cover and the way the book is bounded, were in the beginning a little struggle to me. But in the end I think it fits so well with the topic of ‘a head with wings’. I’m really happy with it. I also have the feeling that this collaboration and time limit have pushed my ideas. I learned a lot from it. SOTH – That’s the beauty of it, that there is this push. So in my own publishing life, with my own books, I actually have little to push against. 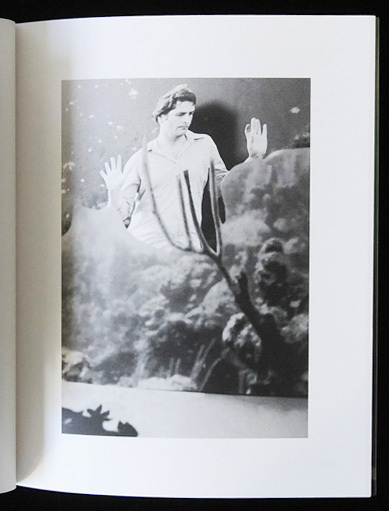 I print with Steidl, and he just lets me do whatever I want to do, basically. SOTH – Yeah, it’s great, and I love it, but at the same time, I think interesting things can come from collaboration and from people pushing against each other. I’m curious about what is it like to have an editor. So I think it’s been really fun for me to have this collaboration with Hans over the years because he has really pushed me to do things I would never do. The books have been way more interesting because of it, and occasionally, I’d have to push back because I’m the publisher guy who has to worry about money and other practicalities. It’s actually quite helpful when I go back to being an artist to know the other side of these things. So I like this tension. For me, it was really exciting to have your perspective and this Dutch design perspective crammed together with a book that’s based on an American children’s book and the limitations of that. KRUITHOF – Collaboration, especially in having conversations about the work is really interesting to me. But like you said, when you got all of my previous books: you know immediately where they come from. It’s mainly because I make them myself. With Playing Borders, the physical dummy I made was pretty close to the end result. With making all my books I try to keep the outcome very close to myself. I believe when you don’t do that, you‘ll end up having coffee table books and I’m really not interested in that. When you make a book: make a book, which has his own existence as a work. SOTH – You mentioned that you made these pictures of the man in the park, but we haven’t talked about how you went about making the final montages. KRUITHOF – Photoshop does not interest me. I thought about why I want to do it by hand, probably it’s a concentration thing. Not working behind a computer, but separating yourself from the computer and making 3d stages around this man. I feel more in control. I can play with It – putting this man in a cardboard environment. I like it also because it goes quick, the cutting, etc. Other people might say this handwork asks a lot of work, which is actually true. I am just a worker I guess, I go on and on and on. The handmade 3d stages and re-photographing them to me is much more playful in the result and surprising during the process, which makes it interesting to me. I also did it like this, because your invitation for this series of books is after the style of a children’s book from the 70s in America. As a kid we all made this shoeboxes with this cardboard worlds inside. The existence of my photos is kind of the same but than not a hole in the box to peek through but a photo camera, which picked the frame. It’s important to me that I used my own snapshots for all of these images, rather than using found footage. The act of making work outside: this social element is important to me. I have a strong drive to go out, that is why I work with photography, video or behave as a scavenger in order to collect and recycle material for my installations. When I am out: I talk to people and gather information and all sorts of little adventures happen on my way. This is what I love in life! SOTH – That’s what I always say: the real world still exists! You spend so much time with this computer in your face that when you go out there…it’s like, wow, real life, how amazing! « At What Age Do Photographers Do Their Most Influential Work? thanks for being so creative.